This happy diamond clover necklace by Chopard is unique both color and design. 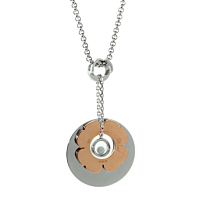 An open, rose gold clover nestles adjacent to a larger, high polished white gold disk and is connected by a white gold link chain. 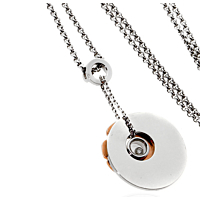 In the center of the larger disk dangles a tiny circle adorned with a .05cts Vs 1 E-F color diamond.